Le sacrifice d’Iphigénie, by François Perrier, 1633. Synopsis: The Chorus and Clytemnestra clamour for the return of her husband and king, Agamemnon, from his victory in the Trojan War. However, a pall is cast as his death at Clytemnestra’s hands is increasingly foreshadowed. 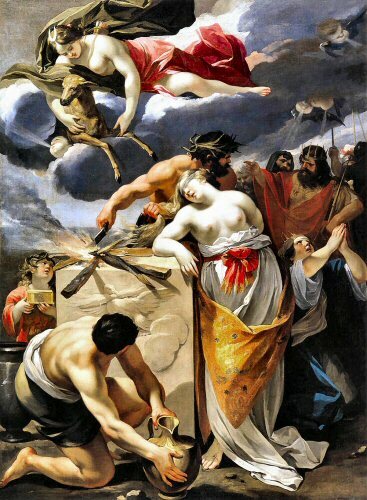 It is prophesied by Cassandra (the Trojan princess taken by Agamemnon as his concubine) that his wife will visit her fury upon him for sacrificing their daughter Iphigenia to Artemis, who had becalmed the winds and so forestalled the Greek ships from setting sail to Troy. She also foretells her own death and enters the palace welcoming its inevitability. Aegisthus, Clytemnestra’s lover, reveals himself as a co-conspirator and the Chorus warns of the return of Orestes, son of Agamemnon, to avenge his father’s death. What moved me: the impotence of the Chorus of old men. we remain, propping on staffs a strength like a child’s. the god of war is not there either. wanders, a dream in the daylight.